Before you even walk into any fencing club or tournament, you’ll hear the bright sound of clashing steel. This is both combat martial art and sport. The modern sport of fencing has three different events: foil, epée and sabre, each with its own history, target area and rules. The goal in all three weapons is to hit the opponent on the valid target area without being hit yourself. 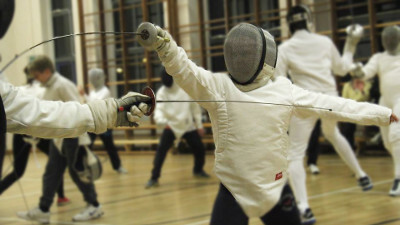 The three weapons in modern sports fencing have developed from training weapons; foil from sidesword, epée from the duelling rapier and sabre from military cutting weapons. The term fencing is a short hand for ‘the art of defence.’ In sports fencing, the first fencer to commence an attack is the attacker; the second fencer becomes the defender, by moving or blocking the attack by using a parry. The return of the attack after a parry is a riposte. It is also possible for the defender to actively counter-attack if their timing is good enough. Sports fencing is effectively three disciplines, according to the different competition rules and target areas of the three weapons. Between the range of movement, timing and rules, it is quite a technical sport, with much to master, for as long as your fencing career lasts. As in other combat sports, fencers’ personalities dictate how they fight; aggressively attacking fencers go all out to seize the initiative; others prefer to wait, or draw attacks reacting to their opponent and controlling the fight. Tactically astute fencers will draw their opponents into traps which predict and exploit that opponent’s weaknesses. Timing and distance are key; stay far enough away from your opponent to avoid being hit yourself, close in for the hit when the opportunity presents; recognise when to begin your attack or defence and be aware how long either will take. Direct attacks rely on speed and timing; indirect attacks are tactical sequences of preparations – feints and false attacks – setting up the final action to score the hit. It can all look very complex when executed at high speed. For all that, fencing is one of the safest combat sports, if not one of the safest sports overall – the accident and injury record is much better than golf, for example. The quality of equipment – clothing, masks and weapons – with the closely regulated competition rules, make it an ideal sport for young and old of all fitness levels. In competition format, with electric scoring equipment, your first guide to what’s happening will be the scoring lights. The fencers are connected to an electronic box with coloured red and green lights indicating a touch for each fencer. White lights indicating hits off-target are used for foil. The referee starts and stops the bout according to the scoring lights or any rule violation. The referee calls halt to pause the bout, interpret the actions and award points for valid hits up to the winning score – generally 5, 10 or 15 hits. With such a fast sport, and an interval on the box of 1/25th of a second, it is possible to get multiple lights at the end of one phrase of a bout. In epée, double hits are allowed, but not in foil and sabre – only one fencer can score at the end of each phrase. Here, it is up to the referee to adjudicate on the timing of attacks, to assign priority or right of way to the attacks and therefore which fencer scores a valid hit at the end of the phrase. This causes the newcomer some raised eyebrows and some ‘what just happened?’ moments. Listen to the referee’s description of the action, and if that doesn’t make sense after a few bouts, feel free to ask an experienced observer. The linear playing area for fencing is known as a strip or piste, a maximum of 14 metres long and 2 metres wide (1.5 metres in a crowded competition venue). Bouts are fought within these marked out areas, or on an earthed metallic surface which prevents floor hits from registering. If a fencer goes off the end of the piste with both feet, the opponent is given a point, even if there is no actual hit. If a fencer goes off the side of the strip with both feet, the opponent advances one meter. We’ll cover competition formats in a future post.